Continuing in the vein of its companion video, Leaves and Flowers, this DVD demonstrates some insect and bird motifs that can be used and adapted for whimsical decorative work and garden-themed pieces. 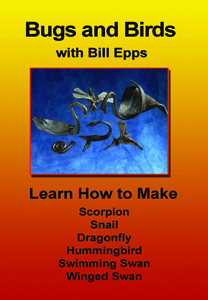 Epps is shown creating critters such as a scorpion, a garden snail and a dragonfly, as well as a hummingbird and two types of swans. These projects range from the extremely simple to the complex , and offer a quick way to add lots of ornamental appeal to a decorative project. Some of these items are used by the artist at demos as quick crowd-pleaser's as well, taking only two or three heats to complete. A brief "chalkboard" segment enhances the viewer's learning opportunity by outlining the steps in creating each item, and enhanced video and sound make Epps' instructions clear and easy to follow. A must-have for the hobbyist or professional!